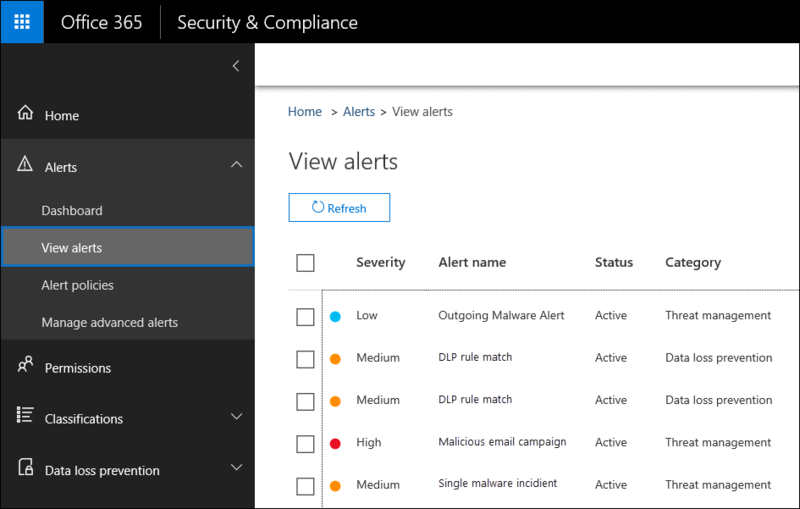 You can use the new alert policy and alert dashboard tools in the Office 365 and Microsoft 365 security and compliance centers to create alert policies and then view the alerts that are generated when users perform activities that match the conditions of an alert policy. Alert policies build on and expand the functionality of activity alerts by letting you categorize the alert policy, apply the policy to all users in your organization, set a threshold level for when an alert is triggered, and decide whether or not to receive email notifications. There's also a View alerts page in the security and compliance center where you can view and filter alerts, set an alert status to help you manage alerts, and then dismiss alerts after you've addressed or resolved the underlying incident. We've also expanded the type of events that you can create alerts for. For example, you can create alert policies to track malware activity and data loss incidents. Finally, we've also included a number of default alert policies that help you monitor assigning admin privileges in Exchange Online, malware attacks, and unusual levels of file deletions and external sharing. Alert policies are available for organizations with an Office 365 Enterprise or Office 365 US Government E1/G1, E3/G3, or E5/G5 subscription. However, some advanced functionality is only available for organizations with an E5/G5 subscription, or for organizations that have an E1/G1 or E3/G3 subscription and an Office 365 Advanced Threat Protection (ATP) P2 or Office 365 Advanced Compliance add-on subscription. The functionality that requires an E5/G5 or add-on subscription is highlighted in this topic. Also note that alert policies are available in Office 365 GCC, GCC High, and DoD US government environments. Here's a quick overview of how alert policies work and the alerts that are triggers when user or admin activity match the conditions of an alert policy. An admin in your organization creates, configures, and turns on an alert policy by using the Alert policies page in the security and compliance center. You can also create alert policies by using the New-ProtectionAlert cmdlet in PowerShell. To create alert policies, you have to be assigned the Organization Configuration role or the Manage Alerts role in the Security & Compliance Center. Office 365 generates an alert that's displayed on the View alerts page in the security and compliance center. Also, if email notifications are enabled for the alert policy, Office 365 sends an notification to a list recipients. The alerts that an admin or other users can see on the View alerts page is determined by the roles assigned to the user. For more information, see the RBAC permissions required to view alerts section. An admin manages alerts in the security and compliance center. Managing alerts consists of assigning an alert status to help track and manage any investigation. An alert policy consists of a set of rules and conditions that define the user or admin activity that will generate an alert, a list of users who will trigger the alert if they perform the activity, and threshold that defines how many times the activity has to occur before an alert is triggered. You also categorize the policy and assign it a severity level. 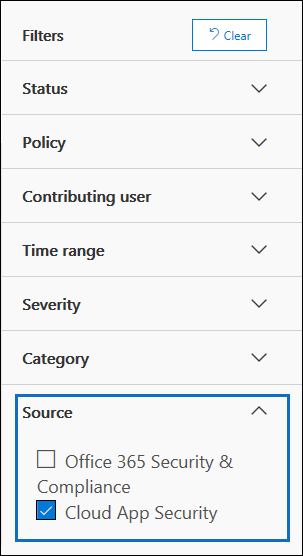 These two settings help you manage alert policies (and the alerts that are triggered when the policy conditions are matched) because you can filter on these settings when managing policies and viewing alerts in the security and compliance center. For example, you can view alerts that match the conditions from the same category or view alerts with the same severity level. To view and create alert policies, go to https://protection.office.com and then click Alerts > Alert policies. An alert policy consists of the following settings and conditions. Activity the alert is tracking - You create a policy to track an activity or in some case a few related activities, such a sharing a file with an external user by sharing it, assigning access permissions, or creating an anonymous link. When a user performs the activity defined by the policy, an alert is triggered based on the alert threshold settings. The activities that you can track depend on your organization's Office 365 Enterprise or Office 365 US Government plan. In general, activities related to malware campaigns and phishing attacks require an E5/G5 subscription or an E1/G1 or E3/G3 subscription with a Threat Intelligence add-on subscription. Activity conditions - For most activities, you can define additional conditions that must be met for an alert to be triggered. Common conditions include IP addresses (so that an alert is triggered when the user performs the activity on a computer with a specific IP address or within an IP address range), whether an alert is triggered if a specific user or users perform that activity, and whether the activity is performed on a specific file name or URL. You can also configure a condition that triggers an alert when the activity is performed by any user in your organization. Note that the available conditions are dependent on the selected activity. When the alert is triggered - You can configure a setting that defines how often an activity can occur before an alert is triggered. This allows you to set up a policy to generate an alert every time an activity matches the policy conditions, when a certain threshold is exceeded, or when the occurrence of the activity the alert is tracking becomes unusual for our organization. 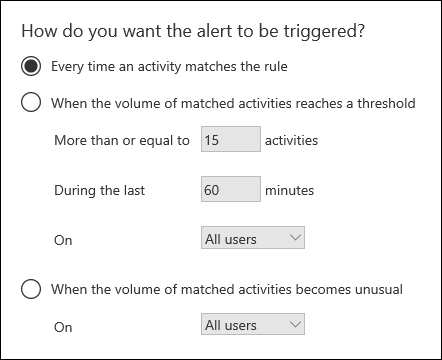 If you select the setting based on unusual activity, Office 365 establishes a baseline value that defines the normal frequency for the selected activity; it takes up to 7 days to establish this baseline, during which alerts won't be generated. After the baseline is established, an alert will be triggered when the frequency of the activity tracked by the alert policy greatly exceeds the baseline value. For auditing-related activities (such as file and folder activities), you can establish a baseline based on a single user or based on all users in your organization; for malware-related activities, you can establish a baseline based on a single malware family, a single recipient, or all messages in your organization. The ability to configure alert policies based on a threshold or based on unusual activity requires an E5/G5 subscription, or an E1/G1 or E3/G3 subscription with an Office 365 ATP P2 or Advanced Compliance add-on subscription. Organizations with an E1/G1 and E3/G3 subscription can only create an alert policy where an alert is triggered every time that an activity occurs. Alert category - To help with tracking and managing the alerts generated by a policy, you can assign one of the following categories to a policy. When an activity occurs that matches the conditions of the alert policy, the alert that's generated is tagged with the category defined in this setting. This allows you to track and manage alerts that have the same category setting on the View alerts page in the security and compliance center because you can sort and filter alerts based on category. Alert severity - Similar to the alert category, you assign a severity attribute ( Low, Medium, High, or Informational) to alert policies. Like the alert category, when an activity occurs that matches the conditions of the alert policy, the alert that's generated is tagged with the same severity level that's set for the alert policy. Again, this allows you to track and manage alerts that have the same severity setting on the View alerts page. For example, you can filter the list of alerts so that only alerts with a High severity are displayed. When setting up an alert policy, consider assigning a higher severity to activities that can result in severely negative consequences, such as detection of malware after delivery to users, viewing of sensitive or classified data, sharing data with external users, or other activities that can result in data loss or security threats. This can help you prioritize alerts and the actions you take to investigate and resolve the underlying causes. Email notifications - You can set up the policy so that email notifications are sent (or not sent) to a list of users when an alert is triggered. You can also set a daily notification limit so that once the maximum number of notifications has been reached, no more notifications are sent for the alert during that day. In additional to email notifications, you or other administrators can view the alerts that are triggered by a policy on the View alerts page. Consider enabling email notifications for alert policies of a specific category or that have a higher severity setting. Office 365 provides built-in alert policies that help identify Exchange admin permissions abuse, malware activity, and data governance risks. On the Alert policies page, the name of these built-in policies are in bold and the policy type is defined as System. These policies are turned on by default. You can turn these policies off (or back on again), set up a list of recipients to send email notifications to, and set a daily notification limit. The other settings for these policies can't be edited. The following table lists and describes the available default alert policies, and the category each policy is assigned to. Note that that category is used to determine which alerts a user can view on the View alerts page. For more information, see the RBAC permissions required to view alerts section. The table also indicates the Office 365 Enterprise and Office 365 US Government plans required for each one. Note that some default alert policies are available if your organization has the appropriate add-on subscription in addition to an E1/G1 or E3/G3 subscription. Generates an alert when a user protected by Office 365 ATP Safe Links in your organization clicks on a malicious link. This event is triggered when URL verdict changes are identified by Office 365 ATP or when users override the Office 365 ATP Safe Links pages (based on your organization's Office 365 ATP Safe Links policy). This alert policy has a High severity setting. For Office 365 ATP P2, E5, G5 customers, this alert automatically triggers Office 365 Automated Investigation and Response. For more information on events that trigger this alert, see Set up Office 365 ATP Safe Links policies. Generates an alert when someone in your organization creates an inbox rule for their mailbox that forwards or redirects messages to another email account. This policy only tracks inbox rules that are created using Outlook on the web (formerly known as Outlook Web App) or Exchange Online PowerShell. This policy has a Low severity setting. For more information using inbox rules to forward and redirect email in Outlook on the web, see Use rules in Outlook on the web to automatically forward messages to another account. Alerts are also trigged when the previous content search activities are performed in association with an eDiscovery case. This policy has a Medium severity setting. For more information about content search activities, see Search for eDiscovery activities in the Office 365 audit log. Generates an alert when someone is assigned administrative permissions in your Exchange Online organization; for example, if a user is added to the Organization Management role group in Exchange Online. This policy has a Low severity setting. Generates an alert when any messages containing malware are delivered to mailboxes in your organization. If this event occurs, Office 365 removes the infected messages from Exchange Online mailboxes using Zero-hour auto purge. This policy has an Informational severity setting and automatically triggers Office 365 Automated Investigation and Response. Generates an alert when any messages containing phish are delivered to mailboxes in your organization. If this event occurs, Office 365 removes the infected messages from Exchange Online mailboxes using Zero-hour auto purge. This policy has an Informational severity setting and automatically triggers Office 365 Automated Investigation and Response. Generates an alert when users in your organization report messages as phishing email using the Report Message add-in. This policy has an Informational severity setting. For more information about this add-in, see Use the Report Message add-in. For Office 365 ATP P2, E5, G5 customers, this alert automatically triggers Office 365 Automated Investigation and Response. Generates an alert when Office 365 can't deliver email messages to your on-premises organization or a partner servers by using a connector. When this happen, the message is queued in Office 365. This alert is triggered when there are 2,000 messages or more that have been queued for more than an hour. This policy has a High severity setting. Generates an alert when an unusually large number of messages containing malware are delivered to mailboxes in your organization. If this event occurs, Office 365 removes the infected messages from Exchange Online mailboxes. This policy has a High severity setting. Generates an alert when someone has attempted to send an unusually large number of email messages containing a certain type of malware to users in your organization. If this event occurs, the infected messages are blocked by Office 365 and not delivered to mailboxes. This policy has a Low severity setting. Generates an alert when an unusually high volume of malware or viruses are detected in files located in SharePoint sites or OneDrive accounts in your organization. This policy has a High severity setting. Generates an alert when an unusually large number of activities are performed on files in SharePoint or OneDrive by users outside of your organization. This includes activities such as accessing files, downloading files, and deleting files. This policy has a High severity setting. Generates an alert when an unusually large number of files in SharePoint or OneDrive are shared with users outside of your organization. This policy has a Medium severity setting. Generates an alert when an unusually large number of files are deleted in SharePoint or OneDrive within a short time frame. This policy has a Medium severity setting. Generates an alert when there is a significant increase in the number of people in your organization using the Report Message add-in in Outlook to report messages as phishing mail. This policy has a High severity setting. For more information about this add-in, see Use the Report Message add-in. Generates an alert when someone in your organization is restricted from sending outbound mail. This typically results when an account is compromised, and the user is listed on the Restricted Users page in the Security & Compliance Center. (To access this page, go to Threat management > Review > Restricted Users). This policy has a High severity setting. For more information about restricted users, see Removing a user, domain, or IP address from a block list after sending spam email. Note that the unusual activity monitored by some of the built-in policies is based on the same process as the alert threshold setting that was previously described. Office 365 establishes a baseline value that defines the normal frequency for "usual" activity. Alerts are then triggered when the frequency of activities tracked by the built-in alert policy greatly exceeds the baseline value. When an activity performed by users in your organization match the settings of an alert policy, an alert is generated and displayed on the View alerts page in the security and compliance center Depending on the settings of an alert policy, an email notification is also sent to a list of specified users when an alert is triggered. For each alert, the dashboard on the View alerts page displays the name of the corresponding alert policy, the severity and category for the alert (defined in the alert policy) and the number of times an activity has occurred that resulted in the alert being generated; this value is based on the threshold setting of the alert policy. The dashboard also shows the status for each alert. See the Managing alerts section for more information about using the status property to manage alerts. To view alerts, go to https://protection.office.com and then click Alerts > View alerts. You can use the following filters to view a subset of all the alerts on the View alerts page. Status - Use this filter to show alerts that are assigned a particular status; the default status is Active. You or other administrators can change the status value. Policy - Use this filter to show alerts that match the setting of one or more alert policies. Or, you can just display all alerts for all alert policies. Time range - Use this filter to show alerts that were generated within a specific date and time range. Severity - Use this filter to show alerts that are assigned a specific severity. Category - Use this filter to show alerts from one or more alert categories. 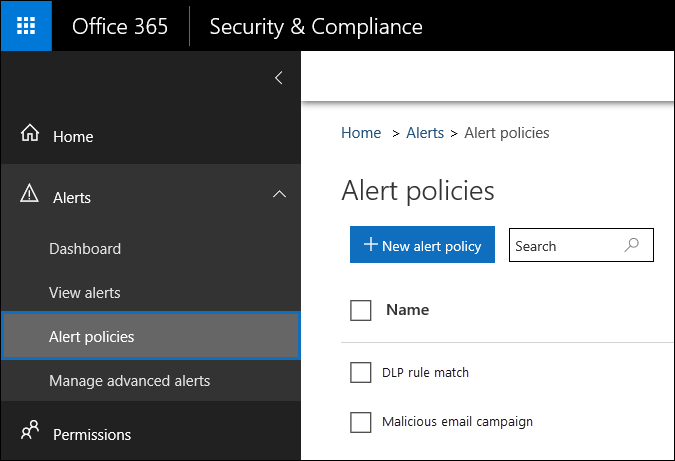 Source - Use this filter to show alerts triggered by alert policies in the security and compliance center or alerts triggered by Office 365 Cloud App Security policies, or both. For more information about Office 365 Cloud App Security alerts, see the Viewing Cloud App Security alerts section. The functionality described in this section will roll out to organizations beginning on February 20, 2019, and will be completed worldwide by the end of March 2019. Members of the Records Management role group can view only the alerts that are generated by alert policies that are assigned the Data governance category. Members of the Compliance Administrator role group can't view alerts that are generated by alert policies that are assigned the Threat management category. Members of the eDiscovery Manager role group can't view any alerts because none of the assigned roles provide permission to view alerts from any alert category. This design (based on RBAC permissions) lets you determine which alerts can be viewed (and managed) by users in specific job roles in your organization. The following table lists the roles that are required to view alerts from the 6 different alert categories. The first column in the tables lists all roles in the Security & Compliance Center. A check mark indicates that a user who is assigned that role can view alerts from the corresponding alert category listed in the top row. To see which category a default alert policy is assigned to, see the table in the Default alert policies section. You can also view the roles assigned to a role group in the Security & Compliance Center. Go to the Permissions page, and click a role group. The assigned roles are listed on the flyout page. After alerts have been generated and displayed on the View alerts page in the security and compliance center, you can triage, investigate, and resolve them. Here are some tasks you can perform to manage alerts. Assign a status to alerts - You can assign one of the following statuses to alerts: Active (the default value), Investigating, Resolved, or Dismissed. Then, you can filter on this setting to display alerts with the same status setting. This status setting can help track the process of managing alerts. View alert details - You can click an alert to display a flyout page with details about the alert. The detailed information depends on the corresponding alert policy, but it typically includes the following: name of the actual operation that triggered the alert (such as a cmdlet), a description of the activity that triggered the alert, the user (or list of users) who triggered the alert, and the name (and link to ) of the corresponding alert policy. The name of the actual operation that triggered the alert, such as a cmdlet or an audit log operation. A description of the activity that triggered the alert. The user who triggered the alert; this is included only for alert policies that are set up to track a single user or a single activity. The number of times the activity tracked by the alert was performed. Note that this number might not match that actual number of related alerts listed on the View alerts page because additional alerts might have been triggered. A link to an activity list that includes an item for each activity that was performed that triggered the alert. Each entry in this list identifies when the activity occurred, the name of actual operation, (such as "FileDeleted") and the user who performed the activity, the object (such as a file, an eDiscovery case, or a mailbox) that the activity was performed on, and the IP address of the user's computer. For malware related alerts, this links to a message list. The name (and link to ) of the corresponding alert policy. Suppress email notifications - You can turn off (or suppress) email notifications from the flyout page for an alert. When you suppress email notifications, Office 365 won't send notifications when activities or events that match the conditions of the alert policy. However, alerts will continue to be trigger when activities performed by users match the conditions of the alert policy. You can also turn off email notifications by editing the alert policy. Resolve alerts - You can mark an alert as resolved on the flyout page for an alert (which sets the status of the alert to Resolved). Unless you change the filter, resolved alerts aren't displayed on the View alerts page. 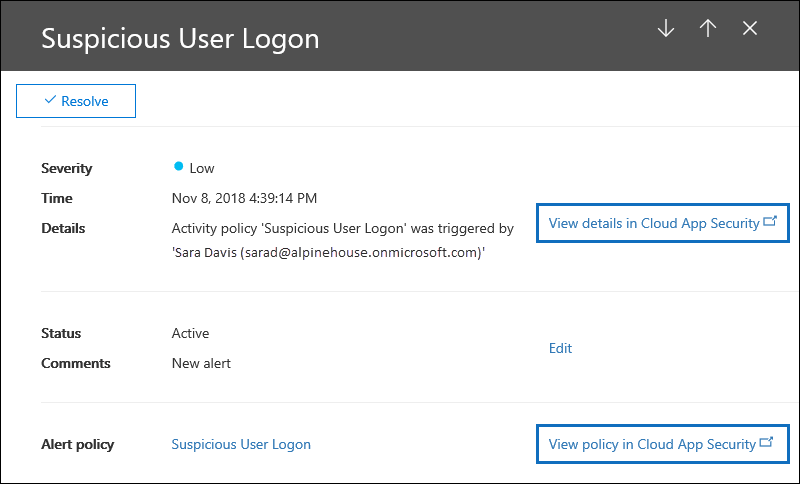 Alerts that are triggered by Office 365 Cloud App Security policies are now displayed on the View alerts page in the security and compliance center. This includes alerts that are triggered by activity policies and alerts that are triggered by anomaly detection policies in Office 365 Cloud App Security. This means you can view all alerts in the security and compliance center. Note that Office 365 Cloud App Security is only available for organizations with an Office 365 Enterprise E5 or Office 365 US Government G5 subscription. For more information, see Overview of Office 365 Cloud App Security. Additionally, organizations that have Microsoft Cloud App Security as part of an Enterprise Mobility + Security E5 subscription or as a standalone service can also view Cloud App Security alerts that are related to Office 365 apps and services in the Security & Compliance Center. To display only Cloud App Security alerts in the security and compliance center, use the Source filter and select Cloud App Security. Similar to an alert triggered by a security and compliance center alert policy, you can click a Cloud App Security alert to display a flyout page with details about the alert. The alert includes a link to view the details and manage the alert in the Cloud App Security portal and a link to the corresponding Cloud App Security policy that triggered the alert. See Review and take action on alerts in Office 365 Cloud App Security. Changing the status of a Cloud App Security alert in the security and compliance center won't update the resolution status for the same alert in the Cloud App Security portal. For example, if you mark the status of the alert as Resolved in the security and compliance center, the status of the alert in the Cloud App Security portal is unchanged. To resolve or dismiss a Cloud App Security alert, manage the alert in the Cloud App Security portal.